Make holiday memory magic with the Barbie Collector 2013 Holiday auburn hair Barbie Doll. This beautiful collector’s item celebrates the 25th year of Barbie’s holiday magic. Since 1988, these breathtaking dolls have taken Barbie to a glamorous and fantastic holiday event and have dressed the fashion-forward diva doll in a gown that is festive, unique and perfectly dazzling. 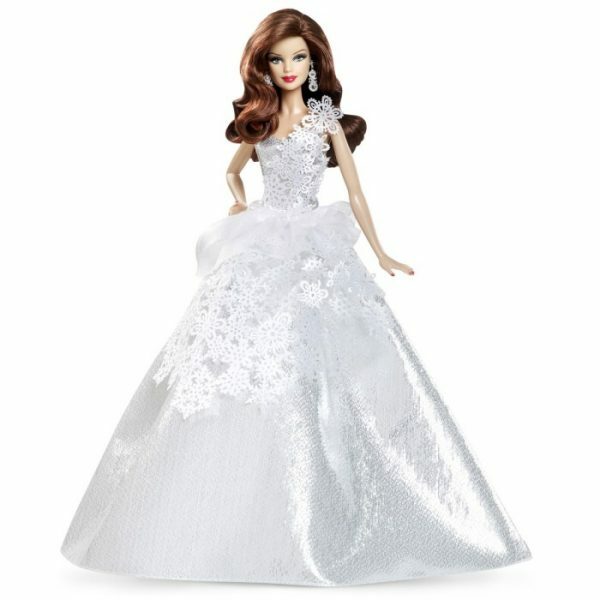 This year is no different, as Barbie comes dressed to the nines in a gorgeous platinum snowflake gown fit for a queen celebrating her silver anniversary! Holiday Barbie with Auburn Hair. Doll wears a festive garnet-colored gown with silvery accents and accessories. Comes in elegant box perfect for gift giving or collections.